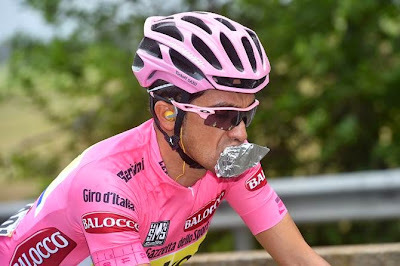 If you didn’t get a chance to watch today’s Giro d’Italia stage, but don’t think you’ll actually bother with a video recap, read on for a blow-by-blow report that doesn’t get mired in political correctness. As I join the action, some guy is angrily gesticulating. I can guess what he’s saying: “Come on, help with the chase, you freeloader!” Such interactions exist in bike racing at every level, even the citizen ranks. GC leader Alberto Contador (Tinkoff-Saxo) has somehow put on a rain jacket, despite having a separated shoulder (suffered in an earlier stage in a massive pileup). He looks pretty miserable though and he’s talking to his teammates a lot. Whining? Could be. I wouldn’t blame him. So how bad is a separated shoulder? Well, in my experience, on the pain scale it’s very significant, about a 6 out of 10, while a broken tibia is about a 4. The cold pressor test, specifically designed to measure pain, is about a 2, right along with having a cavity filled without novacaine. Now, if I hadn’t broken my femur, separated shoulder would be a 10, but I keep having to rejigger my 1-thru-10 scale. So depending on how bad the separation is, Contador must be really suffering. One of the leaders has a really ugly tuck. Looks like he’s trying to lick his tire. Maybe he’s deranged. So, the situation is this: 53 km to go, and a breakaway has a bit under 9 minutes on the peloton, but only 24 seconds over a chase group. The roads are a bit wet and though it’s not raining at the moment, the skies look tenebrous. I wonder how many of the English speakers in the peloton have used the word “tenebrous” today, or ever. Probably more than NFL players, those poor brain-injured guys. So, the biggest name in the breakaway is Franco Pellizotti (Androni Giocattoli). He was 3rd overall in the 2009 Giro, and has won three Giro stages in his career. Today’s stage finishes on the category 1 Campitello Matese. It’s a 12.5 km climb (a bit under 8 miles) but I don’t know much else about it, though you might be interested to know that Amanda Dufner is living it up after divorce from Jason.... (Whoops, sorry—I mistook clickbait for cycling coverage for a second there.) Anyhow, Pellizotti is a climber, so he’ll fancy his chances today. I get to use words like “fancy” because if you weren’t reading this, you’d probably be watching the race on Eurosport and hearing all kinds of chiefly British vernacular. Wow, it’s down to just 35K to go. Time flies when you’re descending, or watching racers descend. The peloton is blowing through a little town, with Tinkoff-Saxo massed at the front. Contador has managed to remove his jacket, somehow. If you don’t think that’s a feat, you’ve never had a separated shoulder. My first physical therapy exercise for mine was to hold a can of soup, with my elbow at 90 degrees, and move my hand back and forth over an arc of maybe 45 degrees, which was agony. How does this guy ride a bike with this injury? There’s actually a trio some distance ahead of the main break, maybe 30 seconds. It’s got Carlos Alberto Betancur Gomez (AG2R La Mondiale) in it, who would be a great climber if not weighed down by so many names. The gap to the main field is a bit over 7 minutes, which is quite a bit, actually, because it’s just not that long a climb. The break is nine guys, including Tom Danielson (Cannondale-Garmin), who is no slouch at climbing. I’m pretty sure he was top-10 in a Tour de France at some point. He holds the record for the Mount Evans Hill Climb in Colorado; it’s the highest paved road in North America at over 14,000 feet. (The Campitello isn’t even 5,000 feet.) Of course, he was very likely totally lubed even back then. Contador doesn’t seem to have any kind of bandage, wrap, or even a tortilla on his shoulder. He looks pretty good on the bike, considering, but I can’t imagine he could ride out of the saddle. I’m reminded, of course, of Tyler Hamilton in the 2003 Tour de France, who got—what, 4th?—with a broken collarbone (and a lot of help from his friends). So, the favorites for the Giro GC are Rigoberto Uran (Etixx-Quick-Step) who was second overall here before; Contador; Porte; and perhaps Fabio Aru (Astana Pro Team). Uran is down 1:22 on the GC, after losing 1:04 in stage 4, so we have to wonder about his form. Aru is only 2 seconds behind Contador in the GC, but somehow I don’t think he’s quite ready to win a Grand Tour. He’s still just a pup. It’s about 20 km to go. Somehow the leading trio has extended their lead to 1:20 over the main breakaway. Along with Betancur are Kristof Vandewalle (Trek Factory Racing), whom I’ve never heard of in my life, and Steven Kruijswijk, who really needs to buy a vowel. Kruijswijk rides for Team LottoNL-Jumbo (the last bit pronounced “Yumbo” to match all the weird Js in Kruijswijk). Two different commentators have pointed out Aru tightening the knobs on his shoes, saying he must be getting ready to attack. I beg to differ. In my experience, tighting the knobs on your shoes indicates the shoe needing to be a bit tighter, nothing more. Not that Aru won’t attack, but geez, they’re still 5-10 minutes from the climb. The gap to the breakaway is falling ... it’s 5½ minutes now, so the leading trio has about 7 minutes. Betancur was 5th in the 2013 Giro and won last year’s Paris-Nice. So he’s no slouch. Kruijswijk, whose name I’m really tired of typing, was 8th in the 2011 Giro. Vandewalle is a world team time trial champ, so I doubt he can climb well enough to win today. It’s just how he was raised. Er, how high up he was raised. How he was born. Whatever. Man, the peloton is still pretty giant. Wow, Contador is riding out of the saddle! I’m going to guess he doesn’t have a third-degree separation of his shoulder because then he’d be blinded by the pain. Betancur attacks the break! And Kruijswijk counters, and has a gap! Man, he looks really, really strong. Back in the peloton, Astana is swarming the front. Maybe they saw Aru tighten his shoe. “He tightened his shoe, man, that’s the signal! Get him in position!” Or is it a shoe-tightening bluff? Kruijswijk has a really big gap! The commentators are oddly quiet about this. Perhaps they dislike trying to pronounce “Kruijswijk” as much as I dislike typing it. He’s got less than 10K to go, but of course that’s a very long way on a climb. He’s got a yellow and black jersey but is too thin to look like a bumblebee. Wow, six Astana riders together at the front, Contador right on them. They’ve gotten the gap to the main break down under 4 minutes. Kruijswijk is 1:18 ahead of his two chasers. He’s in the saddle, looking really solid, bobbing just a bit. In other news, a 72-year-old grandma looks 20. Better than a facelift, according to “Dr.” Oz. Fricking ads. I hate them. Vandewalle is going backwards. I told you he was too big to climb. Former Giro winner Ivan Basso, one of Contador’s Tinkoff-Saxo teammates, is dropped. I think he’s too old for this. The chase group has shattered. Kruijswijk has a minute on the chasers and about 3 minutes on the peloton. Betancur detonates! He’s way over on the left of the road. What, is there more air over there? Astana is really drilling it on the front. The peloton is all strung out in a line. Contador only has two teammates left, but he still looks okay. Sebastien Reichenbach (IAM Cycling) and Benat Intxausti Elorriaga (Movistar Team) are the chasers now, having overhauled Betancur. Porte has two men left to help. The peloton is down to like 18 guys. Uran is still in there. Contador’s teammate Mick Rogers is now dropped, so Contador is down to just one teammate and one good shoulder. Kruijswijk’s lead is down to 2:26 over the peloton, and just 31 seconds over the chasers. It’s looking increasingly like all that difficult pedaling (to say nothing of my difficult typing) will have been for naught. It’s 4.7 km to go. Man it looks cold out there. Wow, some Astana guy is attacking! It’s Fabio Aru! I didn’t recognize him because a) I didn’t know he was in the white jersey of best young rider, and b) this video feed is so blurry. Contador is on him, but doesn’t look happy at all. Uran is right there. Dang, another Astana guy attacks! Who is it? Man, he’s flying! It’s Mikel Landa and he looks seemingly infinitely powerful. He sits 8th on the GC, about a minute behind Contador. Man, it was a really good move. He must have tightened his shoe on the sly because I for one didn’t see it. Sky’s Leopold Konig is on the front now, trying to haul back Landa. But man, Landa is really looking strong. Intxausti attacks! I think those two passed Kruijswijk at some point. Intxausti is the leader, then, but only 46 seconds ahead of the peloton. Landa is bearing down on Kruijswijk and I swear that’s the last time I’m typing that name. It’s still Konig, Cataldo, Porte, and Contador, just locked together like that. Uran still in this small group but never going anywhere near the front. Intxausti has 1.3 KM to go, and in fact is actually increasing his lead. Dang, he’s got 1:11. Damiano Cunego (Nippo-Vini Fantini), who is really fricking old, attacks! And now Aru goes again! Porte is on him quickly, and Contador glued to his wheel. So, not too much of an attack though it might be really frying these guys. Uran is right in the mix. Porte is on the front of this little group now, Contador right on him, grimacing awfully. Up the road, Intxausti is heading for the stage win. He’s got it! It’s the I-can’t-believe-it helmet-grabbing victory salute. And here comes Landa, getting the second-place time bonus. The GC leaders cross the line, still together. I think that Contador will hang on to the pink jersey, though Landa will move up significantly in the GC and become a threat. They’re showing a super-slo-mo of the victory salute, and it was really a combination platter. Waving to the group, looking back, pointing at the sky, clapping his hands, etc. Aru won the sprint among the GC leaders, but Reichenbach had already sneaked in for third, getting the last of the bonus seconds—otherwise, Aru would have taken pink today. The big GC news today is Landa moving into 5th overall; Uran moving up to 8th; and (of course) Contador managing to hang on to his jersey. Man, what a badass. Don’t underestimate how much harder that extra pain makes things. Remember, Fignon lost the Tour de France due to a saddle sore. Contador is warming down on a trainer now. You can tell he’s fried because he’s forgotten to take his helmet off. Or is he just playing it safe? Intxausti is on the podium. Why did these racers switch from cycling caps to baseball caps? They look so, I don’t know, so ... American. I guess it’s because ball caps provide more space for advertising. Instead of showing the podium celebrations, Eurosport is just interviewing various cyclists, along with some has-been, Juan Antonio Flecha I think. I wouldn’t mind, except that I kind of like the podium stuff. Maybe they should have the podium girls interview these guys. That would be a win-win. Man, it’s going to be painful for Contador to heft that giant bottle of champagne. I mean, cyclists struggle with that thing anyway. I remember one guy who tried to lift it to his lips but just couldn’t manage it. They should provide the racers with super-long straws. They’re interviewing Aru. “I had a fantastic team, you can see the work they’ve done, blah blah blah, I don’t even know what I’m saying, I’m having my comments dictated to me through my radio, blah blah blah ginger blah blah blah.” Booooooo-ring. Contador is on the podium. He’s putting on the pink jersey without apparent difficulty. I’m starting to wonder how badly his shoulder is really hurt. The podium girls have flowers in their hair but look bored. To Contador’s credit, he eschewed his lame “pistolero” salute. So, a great day for him all around.